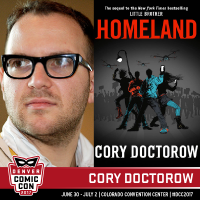 Cory Doctorow is a British-Canadian blogger, journalist and science fiction author, who also serves as the co-editor of the blog Boing Boing, which receives over three million visitors a month. He has written multiple works of fiction, including his YA novel Little Brother, which spent seven weeks on the New York Times bestseller list, and his latest, Walkaway: A Novel, which tells an epic tale of revolution, love, post-scarcity, and the end of death. Doctorow has also penned a graphic novel, In Real Life (art by Jen Wang). He is a proponent of the Creative Commons organization, and is an activist for liberalizing copyright laws, all common themes in his work.